Canada has always been the country of passionate sports fans. There are lots of sports teams, leagues and clubs where people play their favorite sports. Hockey, baseball, soccer, football are just a few to mention. Sports fans are often players themselves and they are happy to watch and support different sport games and activities. Fans are happy when their team wins and are supportive when their team loose. They are like a one big family. With the great number of fans comes the demand to cheer and express love for favorite teams. There are enormous varieties of outfit, gear and accessories with logos, teams and players names available on the market. Recently we had a chance to play with OYO Sports toys. Our sports fans at home were excited about that. OYO Sports creates buildable mini-figures that are designed as the replica of athletes. The figurines are lego-like and represent outfit and complexion of their real life counterparts of major professional sports teams like NHL, NFL, Major League Baseball, major colleges and universities and more. Each OYO Sports mini-figure comes with its own stand and unique number, as well as rotating arms, bending knees, and the ability to hold a bat, stick, glove and ball. OYO Sports figures are officially licensed products of the teams they represent, there is a special hologram sticker on each toy. 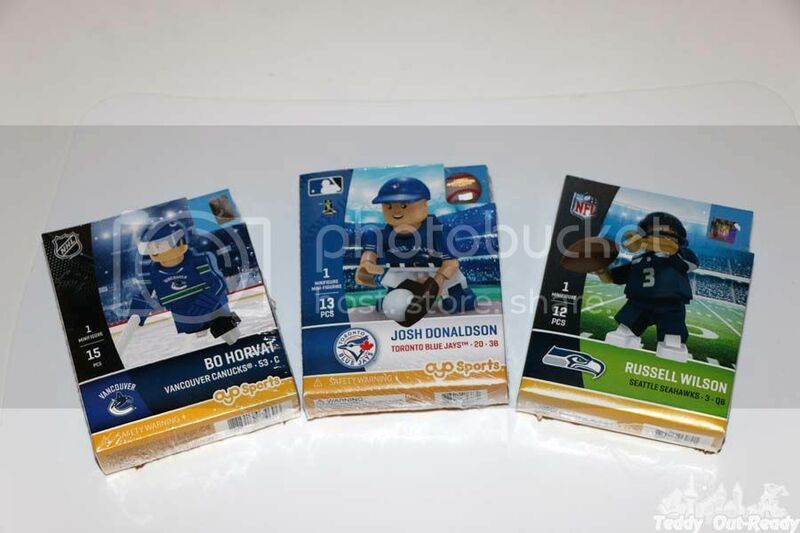 Teddy got three different figurines representing three sports: #53 Bo Horvat Vancouver Canucks, #3 Russell Wilson Seattle Seahawks Home Version and #20 Josh Donaldson Toronto Blue Jays Third Baseman. We like that figurines perfectly reflect real players, their outfit and gear meticulously designed to proudly represent the game and the player. Bo Horvat takes you on ice and ready to bring hockey action to you! He wears an authentic team uniform, helmet with removable visor, skates, stick and gloves. Time to to shoot, pass and skate! 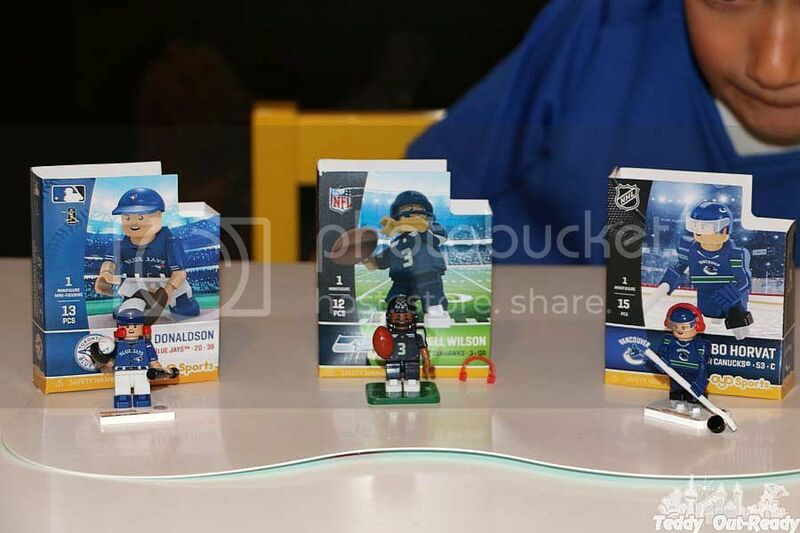 Russell Wilson mini-figure brings real-action play with an authentic team uniform, football, helmet, headphones and removable face mask! He is here to catch a pass or throw the game-winning touchdown. Just let the game begin! Our hometown team player Josh Donaldson mini-figure wants swing for the fences or throw some high heat. He has an authentic team uniform, bat, glove, ball, hat and more. Josh's figurine is eager to show major-league action and make Torontonians proud of his play. Teddy likes playing with OYO Sports toys, they are compatible with major block building blocks like Lego or K'nex. OYO Sports is very serious about details and that's what Teddy likes the most in their toys. They have bendable knees and poseable arms. The gear, accessories and players representation make you feel proud of your favorite team. Teddy played with these toys, throwing and catching a ball, passing the puck and pretending he is playing a real game. Each figurine has a poseable stand with a unique DNA code for your one-of-a-kind toy. When you do not play, you can put it on a stand and give it some rest. 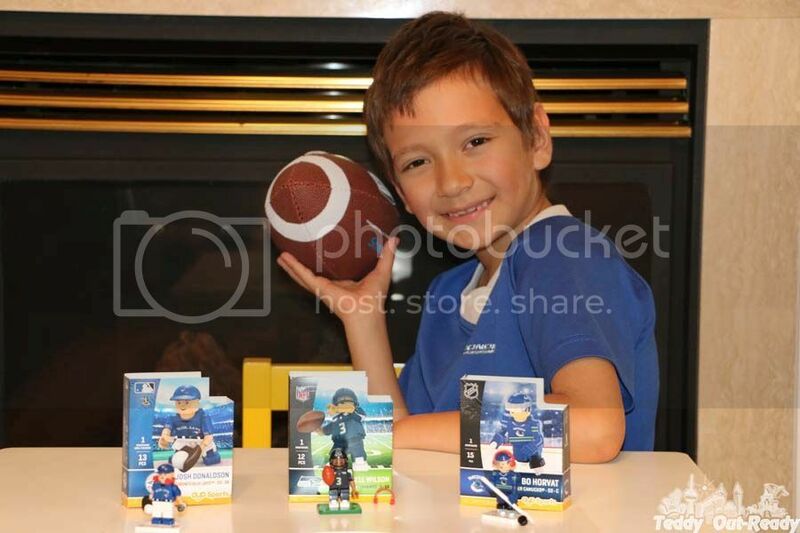 OYO Sports mini-figures make perfect gift for the biggest sports fan in your life. Even if you do not play with them, figurines can be set as a decor on your computer table or night stand reminding you about favorite player or a game. OYO Sports mini-figures are available at sportstoys.ca, Mastermind Toys and Best Buy for $12.99CAD.